Just couldn't resist posting this one! A photo from the Mars Curiosity Rover reveals . . . . a Martian rat? Could it be? Alien rats alive on Mars? Or is it just a rock? Read the article and you decide: http://news.discovery.com/space/alien-life-exoplanets/mars-is-infested-with-pareidolia-rats-130529.htm. The Max Planck Institute for Biological Cybernetics in Tübingen has done a study on how rats see, and it turns out they see things very differently than we do. I have seen websites that try to mimic the way rats perceive the world, as they are believed to have poor eyesight. However, the quality of their vision is not the only difference in what they see. While human beings have stereoscopic vision, with both eyes looking at the same point and combining the image into one picture, a rat's eyes move in different directions independently of each other and thus they have two different field of views. The way their eyes move provides them with a constant view of what is above them - most likely a defense mechanism to protect them from birds of prey. For more information, check out the article Rats Have a Double View of the World from Science Daily. Hero Rats are giant African pouch rats (aka Gambian pouch rats) that have been trained by an organization called APOPO to detect landmines and tuberculosis in Africa.The work they do is really incredible, saving lives by helping to clear land of dangerous minds and by quickly and efficiently identifying missed cases of tuberculosis so that patients can begin treatment more quickly and avoid spreading the illness to others. This video talks about how the rats do their job and how they are trained to do so and why they are so important. For more information about this program, visit the APOPO website (http://www.apopo.org/en/) or like them on APOPO HeroRat Facebook Page. This winning image, by Roy Rimmer, is of a wild brown rat leaping from one rusted paint can to another. It took first place in the Mammal Society's annual photo competition intended to challenge misconceptions regarding misunderstood animals in Britain. I can't think of any animal more misunderstood that the rat, so this is a well deserved win and a fine photograph. To see all the winning entries, check out the article. Ever wonder if rats can laugh? Well, the answer is that not only can they laugh, but they can be tickled - and they like it too! Unfortunately, we never get a chance to hear this laughter because it occurs at a high frequency outside our auditory range. Thanks to this video, provided by Dr. Jaak Panskepp and Huff Post Science, we can hear rat laughter for the first time. This adorable video just makes us want to go out and tickle our rats! Unless you are feeding a balanced high quality lab block as the only source of food, most of us like to offer our rats a little variety and try out new foods every now and then. 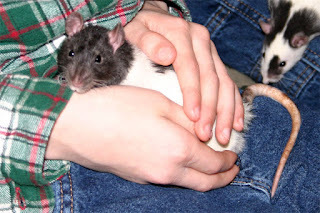 There are a few foods that shouldn't be fed or that should be fed with caution (you can find a list here: http://www.ratchatter.com/rat-food/forbidden-foods/), but otherwise, most of the things that we eat are safe for rats - although not all will be healthy choices. Rats do not have the ability to vomit, so they can be very cautious when trying new foods. Just because they don't try something right away, doesn't mean they won't eat it. 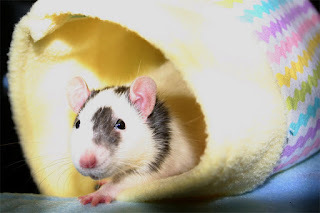 In fact, because rats do not vomit, they will frequently try a small amount of the new food and then wait a while to see if they begin to feel sick. They will then eat more later if there were no ill effects, or avoid the food if it did not agree with them. For breakfast, we offer our rats a bowl of veggies, with a small portion of fruit as well. 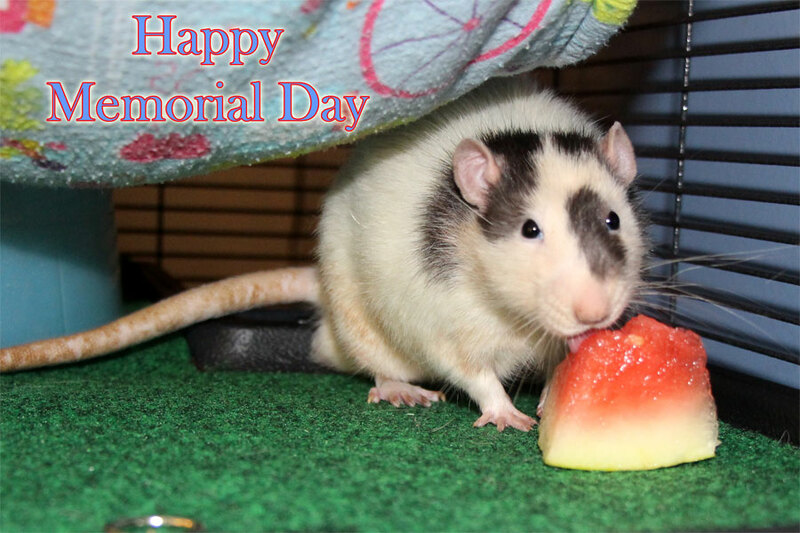 At first, our rats wouldn't touch grapes or blueberries. However, we found that cutting blueberries in half and grapes into quarters made a big difference. Once the juicy inner fruit was exposed, they were much more tempted to try them. And now that they know they like them, we can serve them whole again. Also, remember that rats won't eat when they are full - so just because they reject a new food now, doesn't mean they won't come back to it when they are hungry. Leave the food with them and eventually, they may try it. 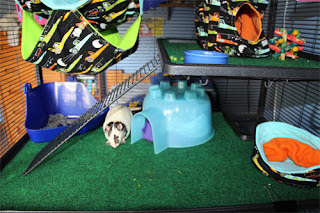 Last week, we installed Zilla terrarium liners in our Critter Nation. It is still to early to tell how well they work, but there were no issues, so Friday, we installed Zilla liners in a Martin's 695. 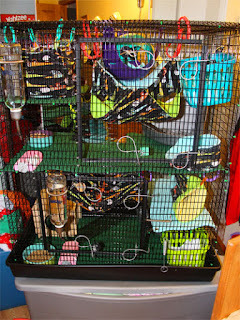 One roll of the 125-gallon size liner covered the floor of the Martin's cage, the middle level, and one shelf. We had to use a fleece liner on the remaining shelf. 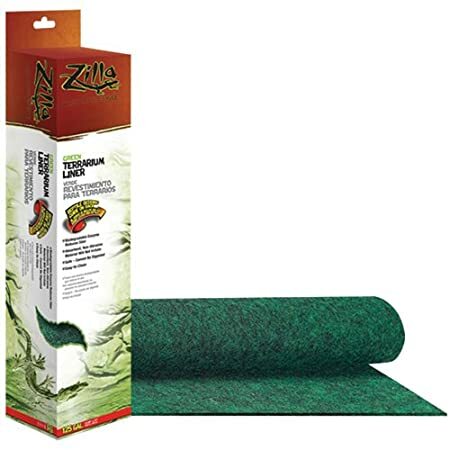 If the Zilla liners work out, we will invest in another package to cover that last shelf. The liner width is 17 3/4" wide and it doesn't quite cover the bottom pan depth fully, but it comes close enough for us. The bottom piece was cut to a length of 31". The top piece was cut to a length of 30", and a notch was cut 7" from the left edge along the back side. The notch is 4 3/4" deep and 10 inches long. The back edge on the other side of the notch is 13" long. One shelf exactly fit the remaining piece of liner and the only scrap was the notch cut out from the top level. The bottom liner is held securely in place by the left and right sides of the cage which sit on top of it. The top liner had a tendency to curl, but was held flat by a litter box on the right side and a ceramic dish placed on the left side near the notch. Hopefully, with time, the curl will flatten. The shelf piece was secured in place with a large binder clip in the center of the exposed edge. Loki lives in the Martin's cage and he did not seem bothered at all by the change in liners. We will continue to monitor the use of these liners in both the Critter Nation and the Martin's R-695 and will report back with our impressions. 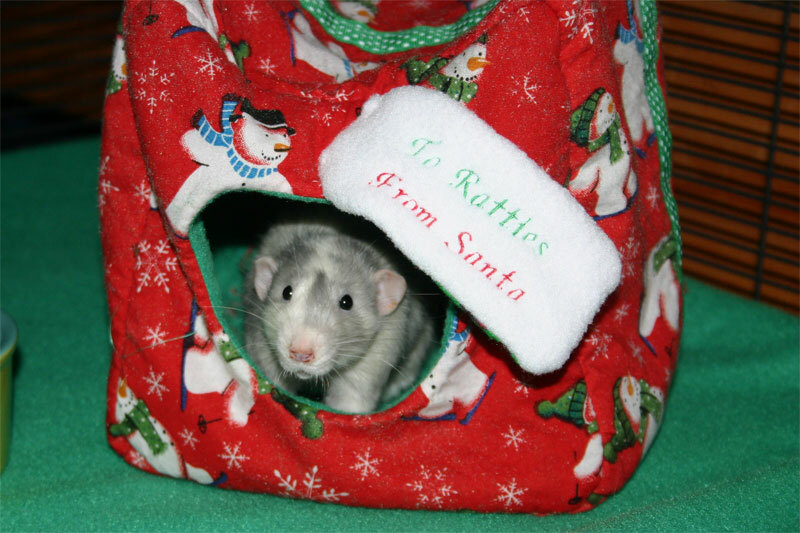 Not all of our rats have liked hammocks (Gabe never took to them, we think he grew up without them and the unsteadiness freaked him out a bit), but everybody has loved a good cube. Cubes are versatile - they can sit on the floor of the cage or hang from the cage ceiling like a hammock, the rats can hang out inside the cube like a hut, or lounge on the top of the cube like a small hammock. Cubes are square, but variations of the cube include a rectangular version and a triangular pyramid. With a little creativity, they can be designed to look like a gingerbread house, a haunted house, an army tent, a treasure chest, etc. The biggest problem we have had with cubes is that the rats feel a need to chew themselves a back door. No sooner would a brand new cube go in, than I would find somebody creeping in or out through a torn corner in the back of the cube. Well, we found a solution to that problem - design the cube with a built-in back door. Problem solved. Of course, the standard hammock chewing still occurs, but not so severely and the cubes last much longer. If you make your own hammocks, we have found that tracing a container of Morton's salt makes for the perfectly-sized entrance hole. Tutorials describing how to make cubes, pyramids, and other hammocks can be found at Ratropolis' Rat Hammock Tutorials page. What Staple Diet to Feed the Rats? With the recent recall of Innova dog foods, we've been forced to revisit this question. And that is probably not a bad thing. It is not enough just to make a decision, but it is also important that we keep reviewing the effects of that decision. Most commercial diets that are available in pet stores and are marketed towards rats are not nutritionally appropriate for them. Anything in the form of a mix, with seeds/nuts/grains, is not appropriate as the staple diet for a rat. It might be suitable for an occasional treat, but not as the main source of sustenance. Harlan Teklad diets are manufactured as diets for lab rats. As such, they need to be nutritionally complete, because lab rats are fed lab blocks and only lab blocks. Introducing other foods can cause disparity between control and test groups and it is important that dietary variables are kept completely constant so that they do not affect the results of the trial. Thus, not only is the Harlan Teklad diet guaranteed to be as complete as our current knowledge can make it, it is also manufactured consistently across batches. Harlan Teklad is also available in multiple formulas, each with different protein levels, but the only one commercially available is 18% protein. The other formulas are available from some rescues. 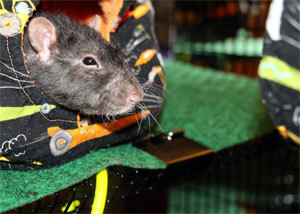 Harland Teklad is the choice among many rat lovers because it is nutritionally complete. However, there are a few drawbacks. First, it is only truly balanced if that is the only food being fed to the rats. Once we introduce anything else (fruit, veggies, cereal, treats, table scraps), that balance goes out the window. 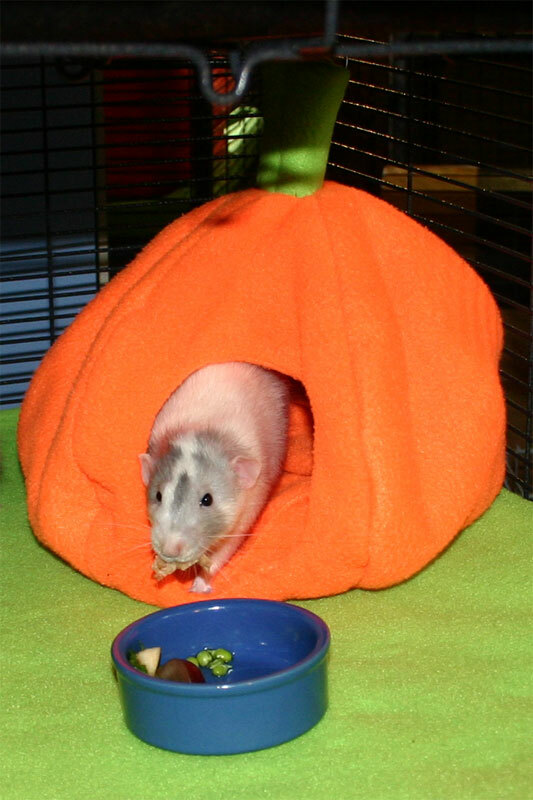 Most pet owners enjoy introducing their rats to a variety of healthy foods and a few guilty pleasures. Second, Harlan Teklad isn't readily available. It can be purchased in very large bags from some online retailers in the form of Native Earth, but that incurs high shipping costs, or it can be purchased from some rat rescues, who buy the larger bags and then divide it up into smaller portions for sale to support their rescue. Finally, Harlan Teklad is not made with the finest ingredients. Just because it is balanced and consistent does not mean it has to be wholesome. One of the biggest drawbacks is the inclusion of dried corn, which may contain a fungus known as aflatoxin. With last year's very dry summer, aflatoxins are going to be an even more prevalent problem than usual. 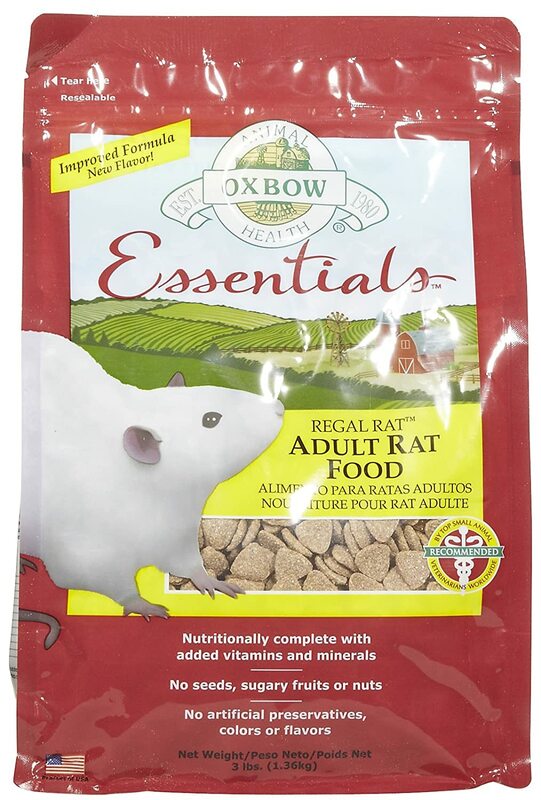 Oxbow Regal Rat is more readily available, being sold in pet stores and online and being packaged in smaller quantities for those of us with only a few rats. The ingredients are not perfect, but okay, and it is free of corn. At one time, the big complaint about Oxbow was that the rats wouldn't eat it. It used to be apple-flavored, and apparently, that was not a popular choice - no surprise to me, as my rats have never been particularly fond of apple slices. They have since changed to a cheese flavor, and most rat owners now report that their rats like it. We have tried feeding this to our rats, but they still didn't eat it, even with the new flavor. However, they have likely been spoiled by the high-quality dog food that we normally feed. 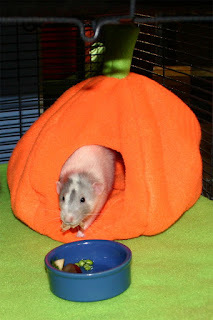 When we adopt new rats, I would like to try this food again. This food is probably not the best for young rats, as the protein content is too low. If feeding this to young rats, be sure to supplement with foods high in protein, like some hard boiled egg. 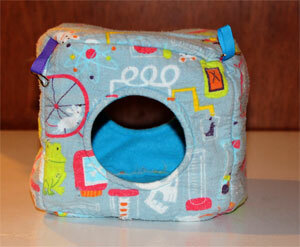 First, it is important to note that this is not the same Mazuri block that is available in pet stores. The block available in pet stores is much higher in protein - somewhere around 23% - too high for any but the youngest of rats. 6F is available from online sources and may also be available from feed stores. This food also suffers from poor ingredients, with corn being the first ingredient on the list. It also includes the preservative BHA, which many people like to avoid in pet foods. If the quality of ingredients is more important to you than the nutritional balance of a food designed specifically for rats, then you have two options. You can look for a high-quality dog food with human grade ingredients that also has the approximate fat and protein contents appropriate for rats or you can attempt a fresh diet. High-quality dog foods are also more readily available than many of the approved rat diets, so you may have an easier time finding them in a pet store or in more remote regions. In general, when selecting a dog food, we like to avoid anything with corn. Read the ingredient list and look for human grade ingredients and avoid anything with byproducts and artificial preservatives/chemicals/additives. We look for something with a fat content close to 6%. Ideal protein content depends on the gender, age, and fitness of the rats. For large males, 14% is ideal. For females, 16% is ideal. For young ones, 18% or even higher is okay. However, it is unlikely that you will find any dog food with protein contents so low. Innova Low Fat used to be at 18%, but then changed its formula and went up to 20%. 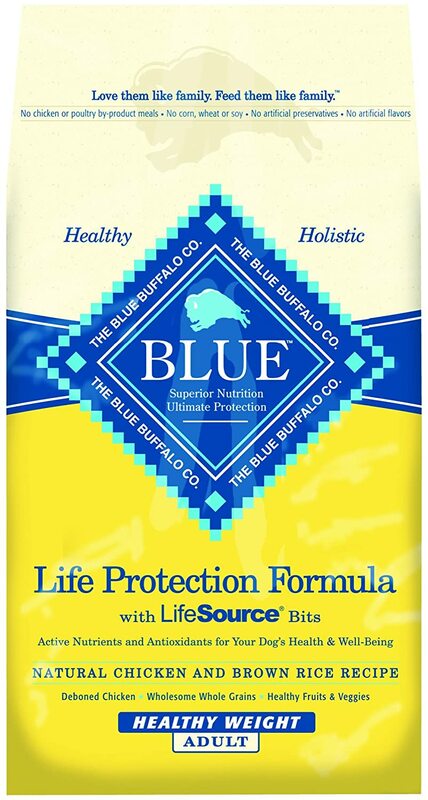 Blue Buffalo Healthy Weight comes in at 20%, which is about as good as I have been able to find. Dogs, in general, need more protein than rats, and the dog foods are formulated accordingly. The best dog foods for rats tend to be low-fat, weight maintenance, or senior varieties. However, all is not lost. When feeding a dog food, it is usually recommended that the diet be supplemented with other foods, including cereal/grain mixes, that can help bring down the total protein content in the diet. In other words, dog food should not be fed as the only source of nutrition. When Innova was pulled, we switched to the Blue Buffalo Adult Healthy Weight dog food. The rats like it and it has healthy ingredients, 6% fat content, and 20% protein. I would like to try the Oxbow to see if I notice any changes in health/fur/behavior on a diet formulated for rats, but my rats won't eat it. We are not a fan of corn, so the other options are out for us. When we get new rats, though, we would like to make Oxbow a part of their diet to evaluate the effects of a rat-specific diet. Recently, there has been some mention on a few of the boards about using Zilla Terrarium Liners to line rat cages. We had not heard of this before and after doing some research and finding that several people online have used this product with good success and no issues (no chewing or tunneling under the liners or injuries/ill effects on the rats), we thought we would try some out and see how it goes. We went with the 125 gallon size, available only in dark green, which comes on a roll that is just shy of 18" wide. In a Midwest Critter Nation, one roll will cover a main level and one shelf - so one roll is sufficient for a single unit. Two rolls are needed to cover a Dual Critter Nation. Then one would likely need a second set to use while the first set is being cleaned and left to dry. The liner needs to be cut to size, which is easy to do - especially if you have a rotary cutter set (used for quilting, but also used by many who make hammock sets for cutting perfectly straight lines). We cut ours to fit the inside of the trays (so the lips of the trays are not covered). This could potentially lead to chewing of the tray sides, but our current rats are not big plastic chewers. Since the roll is not wide enough to cover the large trays with one piece, two pieces need to be cut for each large tray. For the bottom unit, we cut one piece that is 17 1/2" (default width of the roll) x 21 1/2", and one piece that is 15 3/8" x 21 1/2". We did not connect these pieces, it seemed to work fine just allowing them to sit side by side. For the top large tray, the smaller piece needed a notch cut out that was 5 1/2" wide and 9 1/2" long in the top right corner, to accomodate the ramp opening. The smaller shelf trays can be covered by one piece of liner that is 15 1/2" x 21." (Be sure to double check the measurements of your own cage before cutting any liners). Once all pieces were cut, there were no usable pieces of liner left from the two rolls. Because the liner comes in a roll, it has a tendency to curl. We were able to get most pieces to lie flat, just by placing the normal cage accessories on top (huts, litter boxes, ramps, food dishes, ets). 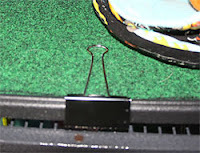 Large binder clips (2" x 1") can be used to clamp the liner to the tray if curling persists. I am guessing that with use, the liners will flatten out, but only time will tell. We will report back on that in a future post. The material is supposed to be extremely absorbant and to control odors with the help of an enzyme coating. 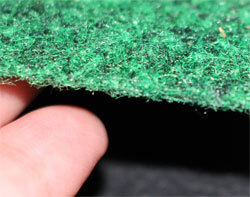 The material is tough and rough - reminiscent of felt, but much stronger and more durable. Despite its rough texture, the product claims that the material is non-abrasive and will not irritate sensitive feet or skin. So far, I have noticed no ill effects on Pirate, but again, I will be watching this. It does not have the soft appeal of using fleece liners, but as long as the cage is equipped with plenty of hammocks and fleece scraps/blankets to line huts and such, the rats should have plenty of other soft places to lie around. Our rats rarely lie out on the open on the ground. Pirate did not seem bothered at all by the texture. Supposedly, the product can be cleaned by rinsing with cold tap water. We plan to clean ours by either laying it in the shower for a while, or soaking in a tub, or hosing off outside. It then can by layed flat or hung to dry. When odor-reducing properties begin to fail, the product will need to be replaced. We will report how long the liners last for us when we have that information. The product is made from recycled materials, making it an eco-friendly option for lining a cage. It looks nice, trim, and neat, but only comes in green at this size. At other sizes, it comes in a tannish brown color. Pet stores carry this product, but we have not seen the 125 gallon size at our stores - we had to buy ours online. I do miss the brightly covered fleece lining the trays - they always made the cage pop with color and look especially nice when coordinated with the hammock design. Easy to Cut to Fit Only come in green or tan How long will they last? Neat, thin, and tidy Not as soft as fleece How well will it control odors? Heavy, discourages burroughing Will it be chewed? In a few days, we will install these liners in the Martin's cage as well, to see how well they work in a wire cage with wire levels. Pirate's Vet Follow-up - Salmonella or Respiratory? Pirate had seen the vet earlier because of a sudden lack of appetite and heavy breathing. He had been fine and then was suddenly drastically ill. He had lost 50g and wasn't interested in his veggies or baby food or yogies. We thought it was a return of his chronic respiratory problems, triggering a lack of appetite - but it was troublesome that it got so bad in such a short time-frame. Later, Petsmart notified us that his Innova dog food was recalled for possible salmonella contamination. Of course, this worried us greatly. Was it possible that his respiratory symptoms got triggered because of an infection like Salmonella? If you try to find information about Salmonella in pet rats - there is next to nothing out there. Most of what you will find is about humans catching salmonella from rats - very little about how salmonella presents in rats and how to treat. The Rat Guide does not seem to cover this illness - at least not that we could find. The best information available came from PetMD: Salmonella Infection in Rats. We put him on antibiotics (doxycycline) and a bronchodilator (theophylline) for his breathing. He has improved tremendously on this treatment. His breathing is fine and he has started eating most foods again. He is still not eating his kibble very much (we switched him to Blue Buffalo Healthy Weight Adult), but he is eating most other foods and is acting much more like himself. So this morning, he went back to the vet for his follow-up, and I am pleased to report that he is doing extremely well. He has gained the 50g back and has returned to his normal weight. We do not know whether it was salmonella or respiratory or something else, but I am glad he has recovered. We are keeping him on the antibiotic for a bit just to make sure we knocked this thing out. It is so nice to see a sick rattie get better. We always worry when they stop eating, because things can go downhill quickly from there. Another example of why vet care is very important to these little guys. This companion blog will keep you up-to-date with our rats, to give you an idea of what it might be like living with rats on a daily basis. Of course, every rat is its own unique experience, and every day is a new adventure. Pirate is a 1 1/2 year old big boy, standard ears and standard fur, white with black markings, weighing in at almost 700 grams. He is a real sweetheart - never bites, loves to be rubbed behind the ears and will boggle so hard you would swear his eyes might pop out. He is also a big licker. As a baby he was quite timid, but has overcome that well. Loki is Pirate's brother, also a 1 1/2 year-old big boy. He is a black-hooded rex, which means he has curly fur and whiskers. Loki is much more skittish than his brother and doesn't get along with other rats. He used to live peacefully with his brother, but then recently, he suddenly started attacking him, so they had to be separated. Loki is very happy living alone - a rarity for rats, who usually prefer rat company. He likes spending time with his people and is trying to learn some tricks, but if he smells Pirate on you, he will bite. As long as you are Pirate-free, though, he loves his people. Because rats in general don't like to be kept alone, we will be getting Pirate some friends this coming June. Stay tuned for posts about the new additions when they arrive.